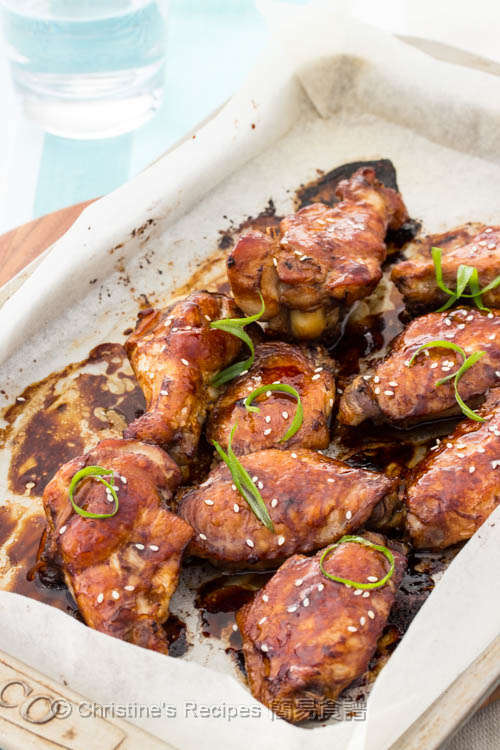 To make these juicy and tasty honey and ginger chicken wings is pretty easy. 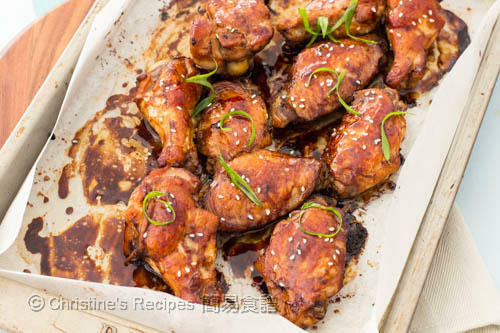 Mix the chicken wings with marinade and pop them in the oven. Here come chicken wings again. Yes, my family and most of my friends like chicken wings. Baking chicken wings is like a piece of cake. Simply mix them with the marinade, pop them in the oven. Then you can enjoy juicy and tasty wings after 30 minutes. You might want to marinate the wings and keep them in fridge for a hectic day ahead. 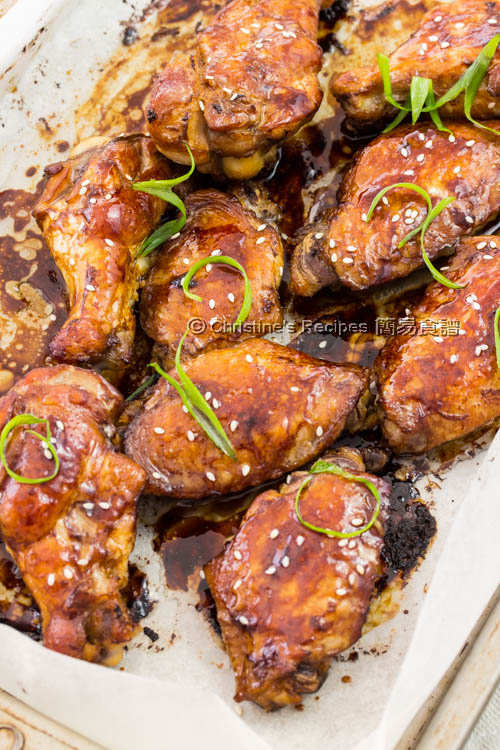 These baked honey and ginger chicken wings are perfect for a bowl of steamed rice, or have them as snack, or finger food in a party. Sounds attractive enough? Rinse and drain the Chicken wings. Wipe dry with paper towel. Combine with the marinade well. Cover and chill in fridge for about 3 hours, or overnight. 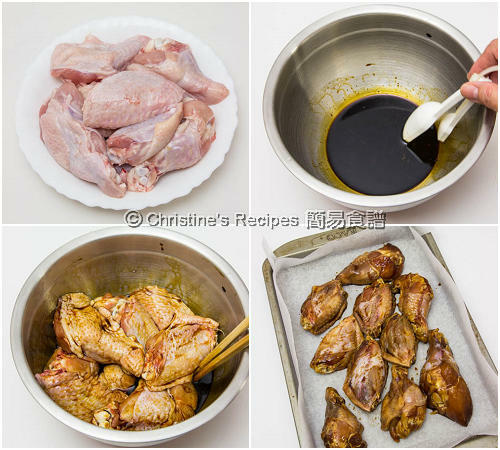 Remove the chicken wings from the fridge and let sit at room temperature for 15 minutes. Transfer to a lined baking tray, in one layer. Bake in the preheated oven for 15 minutes. Turn the wings to the other side. Brush with the marinade to keep moist. Increase oven temperature to 200C / 390F. Bake for another 15 minutes, until golden brown and cooked through. Sprinkle sesame seeds and spring onion. Serve hot. The amount of ginger juice and honey can be adjusted to your preference. The marinade almost reminds me of Japanese teriyaki sauce. Those chicken wings look fingerlickingly delicious! How did you make the ginger juice? I used a grater to grate ginger first, then squeeze with my clean hand. Glad that you loved it. Thanks for trying my recipes.